This August, a very interesting week at the 10th European Palaeobatany and Palynology Conference (EPPC) in Dublin ended. This meeting, which is held every four years, offers a unique opportunity to meet and collaborate with a variety of Palynologists from all over the globe and learn the state-of-the-art. Issues such as climate change –a significant subject of debate in scientific circles nowadays- and environmental research through time were intensively discussed and criticised constructively. 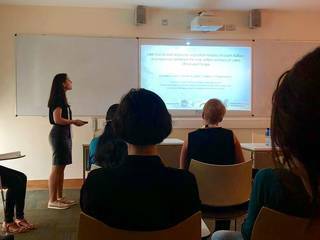 The meeting started on August 13 with oral and poster presentations on a large variety of topics. 35 special sessions and 2 poster sessions had been organised and more than 650 Palynologists and Palaeobotanists engaged in this conference, with a great participation of young scientists. In the mornings, plenary lectures and keynote speeches took place, covering both palaeontological and contemporary aspects of Palynology. I opened the session entitled ‘Work vertically, think 3-dimensionally: palaeoecology in topographically complex mountain settings ‘giving successfully my talk entitled ‘Late Glacial and Holocene vegetation history of south Balkan: a comparison between the new pollen archives of Lakes Ohrid and Prespa’ on the first day. I received very positive feedback and interesting questions that gave to me new innovative ideas for approaching my research. Furthermore, I presented my Master thesis entitled ‘Plant landscape dynamics of west Attiki (south Greece) since the Late Glacial’ in a form of a poster. During the second day, there were plenty of very interesting talks at which I tried to participate in keeping notes and making constructive discussions with the speakers. The poster session continued and many people discussed with me about my master thesis giving to me positive comments for my work as well as follow-up ideas for continuing and developing my research. The next three days I managed to participate in as much talks as I could, regardless of my specific research interests in order to broaden my horizons. Overall, the EPPC conference offered me a great opportunity to discuss further ideas on innovating methods of palynological analysis and to exchange experiences with fellow specialists, receive constructive criticism on my work and develop professional contacts for a potential PhD position. I would really like to thank the GSGS Committee for supporting me with this travel grant to attend this conference which undoubtedly contributed in my future career.